Five really old cans of Chef Boyardee. | Dinosaur Dracula! Let’s look at five ancient cans of Chef Boyardee pasta, because of course I have those. From 1986, it’s both my oldest can and the prettiest… even if one must approach “golden chicken flavored sauce” with healthy trepidation. The milky, yellow glop looks not entirely dissimilar from cat vomit. Intellectually, I get that “golden chicken” only implies that chicken-based sauce is naturally yellow. Still, pairing those words makes me imagine a splinter group of mutant chickens that I’ve never known to exist outside the confines of Pac-Man Pasta. 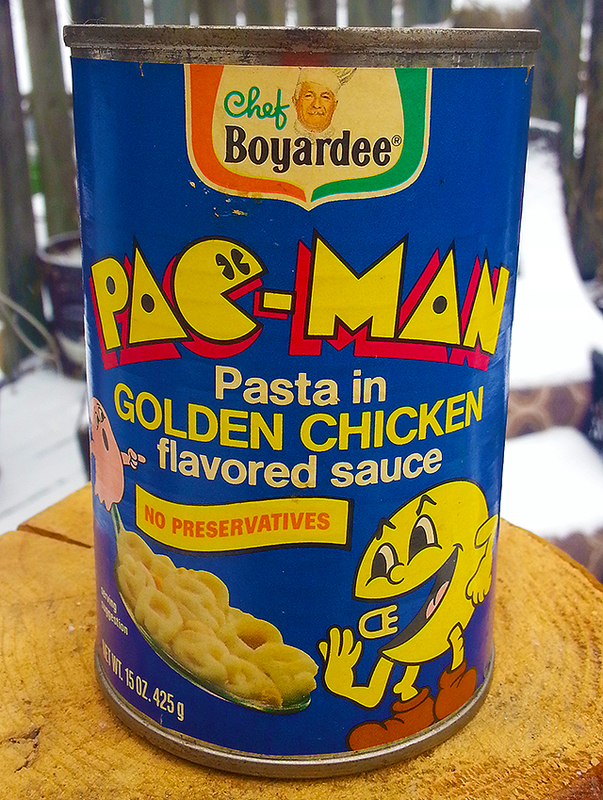 On the upside, the pasta shapes include Pac-Man, ghosts and power pellets. 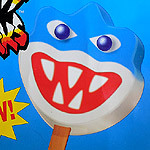 On the even uppier upside, the label’s gorgeous blue background gives it a subtly oceanic theme, which despite being miles away from canonical lore still somehow works for Pac-Man. 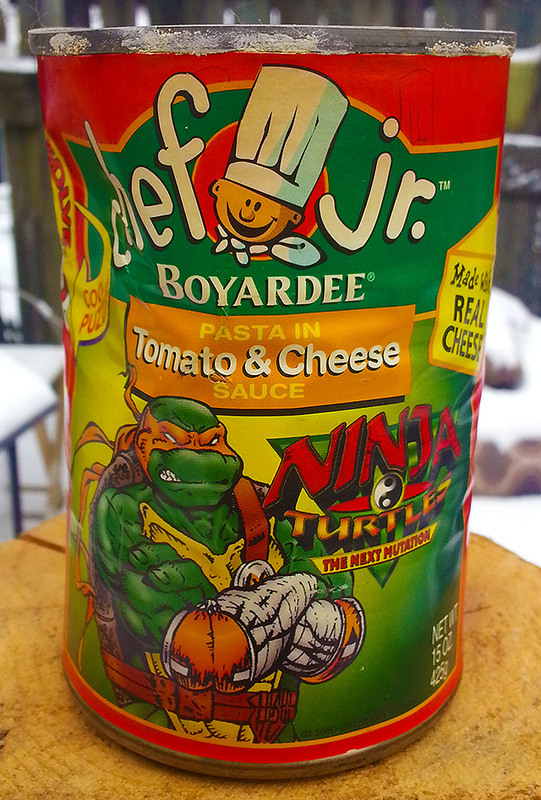 Teenage Mutant Ninja Turtles Pasta! 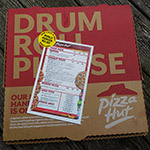 The back of the label boasts that it’s “the best food since pizza and you don’t even have to call out for it.” That’s untrue! 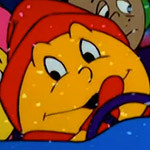 You wouldn’t call out for microwave pizza, and sure enough, the Ninja Turtles had partnerships with microwave pizza brands at the exact same time. I just sent a letter of complaint to Chef Boyardee’s consumer affairs department, and if you think I’m kidding, I’ll show you my free pasta coupons when they arrive in six months. 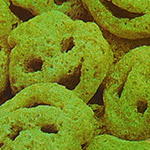 Teenage Mutant Ninja Turtles Pasta was made with monosodium glutamate, hydrolyzed plant protein and soy protein isolate. If you ever need to hone your Krang impression, reading this list of ingredients will make it feel much more organic. The can is undated, but I’m guessing it’s from the mid ‘90s. The shapes included a full-body Spider-Man, Spider-Man’s head, and a “regular” spider web which in fact may not have belonged to Spider-Man. 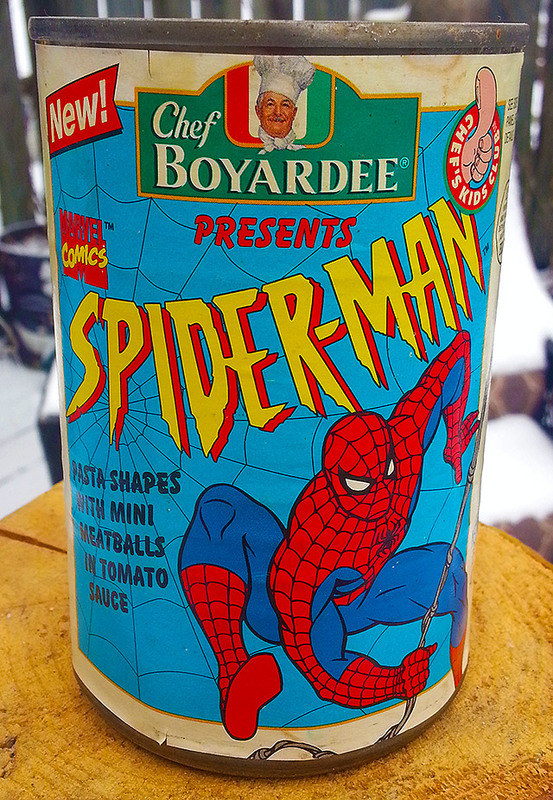 Since the can is still full, I own what’s probably the last remaining serving of Spider-Man Pasta in the entire universe. I’ve decided that this is my biggest ace in the hole. All I have to do is wait for the very specific perilous scenario in which the only possible escape will involve twenty-year-old Spider-Man Pasta. Uncle Ben Kenobi will materialize over a bed of glowing mist to tell me when it’s time. I feel I have an extraordinary memory, which is a blessing when I misplace keys but a curse whenever somebody brings up high school. 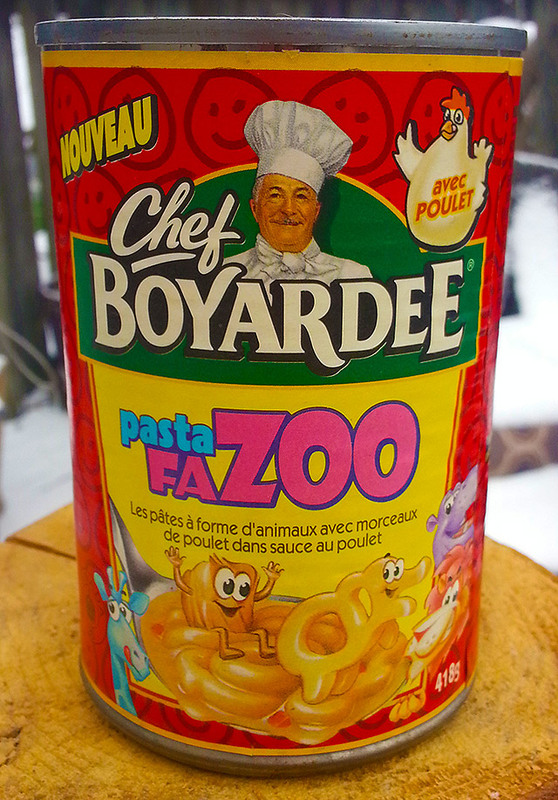 Even so, I have absolutely no idea how I came to be in possession of a Pasta FaZOO can, much less one with an entirely French label. Ninja Turtles: The Next Mutation Pasta! 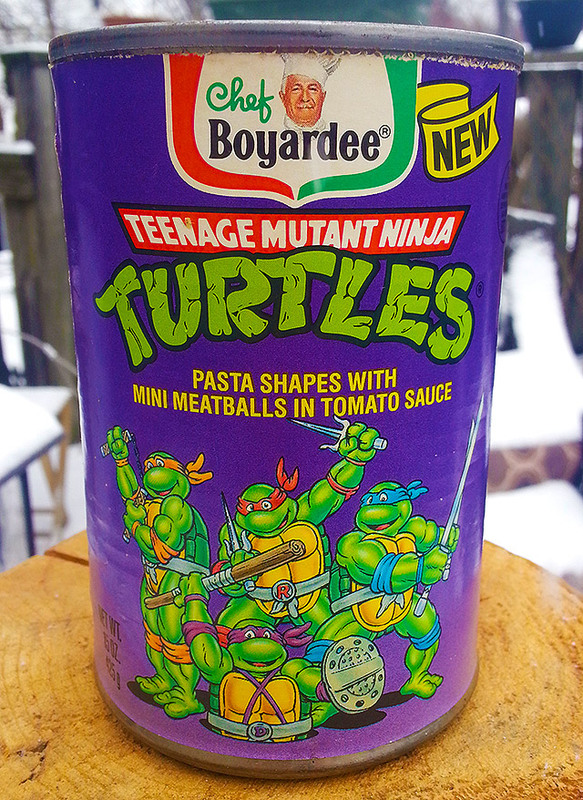 Yep, another can of TMNT pasta. From 1997, this one was based on the Turtles’ ill-fated Next Mutation revamp. I bought it long after it’d already expired, and it came to me in this dented condition. I like to imagine that some starving man was trapped in a basement with no way to open it, and ultimately died trying. Now that I see those sentiments typed out, maybe I should take them back. Thank you for reading about five old cans of Chef Boyardee. The fact that you did speaks volumes. 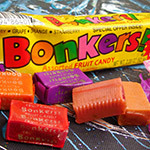 Unwrapping BONKERS candy, from 1989! 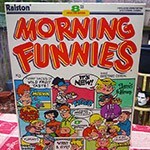 Five More Cereals From Beyond The Grave. The Ninja Turtles invade Pizza Hut!